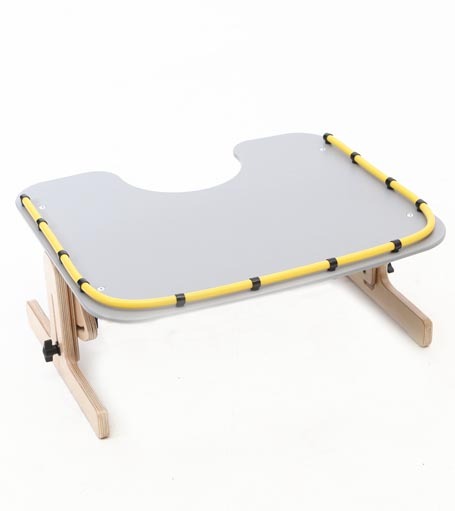 The Jenx Nursery Table is available in three sizes to suit children from nine months to six years old. 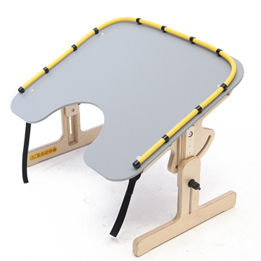 It has a large, plastic play/activity surface and can be used flat, angled or as an easel. 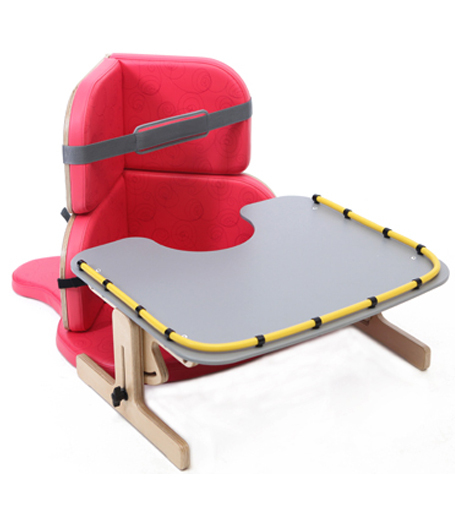 The frame is adjustable for height and the Nursery Table can be used to great effect with the Jenx Corner Seat. A short strap attaches the two items in use to prevent a child tipping the table over. 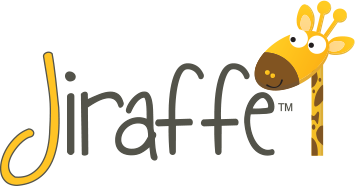 It’s smooth, wipe-clean laminate surface means you can use suction prompts or toys. 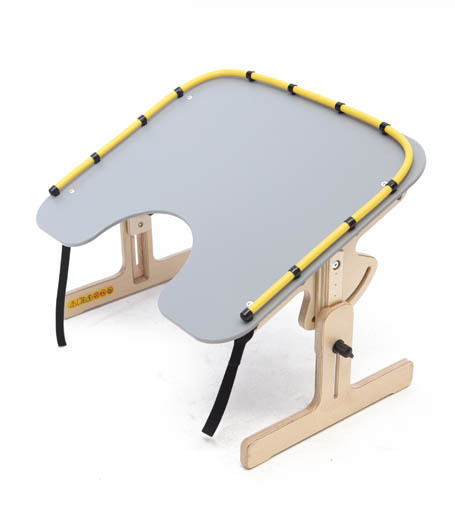 It is cut out to one side to allow the child to get really close to his or her table-top activities, and has edging around the remainder of surface to reduce the risk of objects sliding off. 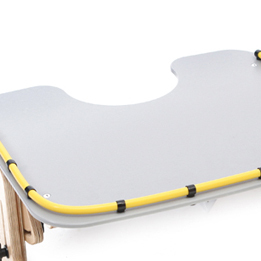 The Jenx Nursery Table is cheerful and adaptable – a great item for all sorts of activities. 3 sizes. 9months – 6 years old. The large surface is big enough for a child to play or work at most activities with ease. The smooth surface is ideal for using for drawing and writing activities and it is possible to attach suction toys to the smooth surface. The edging is bright and a good contrast to assist children in identifying their area of work. It prevents items from being knocked off the table, and the space beneath the edging allows for dirt to be brushed through for cleaning. The cut out on the table gives children the opportunity to be surrounded by the work surface, which means that even children who find it difficult to bring their hands well forward will have their arms supported. This in turn helps them to access the activity on offer. Many young children find the cut out gives them a feeling of security. Children can work from either side of the table, making this an ideal system for children to play on together. One child can work on the cut out side and the other on the side with the edging. The Nursery Table can be easily adjusted for height. Adjustment is continuous rather than incremental, so every child can have their table at precisely the correct height for them. 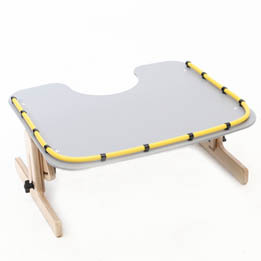 This feature allows the Nursery Table to be used by children using a Corner Seat or other floor seat, or by children who are able to sit unaided. This gives rise to endless play opportunities with friends. Try with the Jenx Corner Seat! 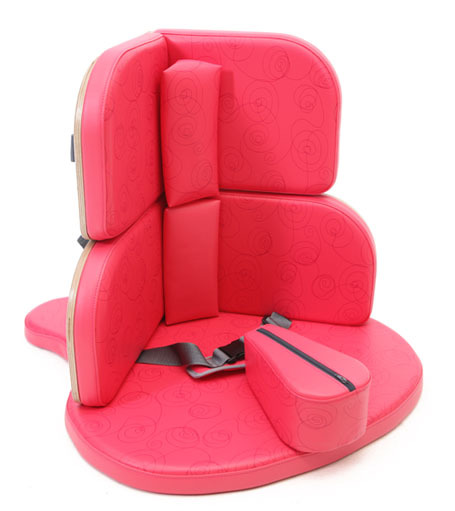 The Jenx Corner Seat is available in three sizes to suit children from six months to approximately 10 years. It offers children support in long sitting, which is children’s usual first sitting position. The Corner Seat has an adjustable height back and can be used with or without the upper back support. An abduction block is used to help keep your child well positioned, with their hips neatly back into the seat. It’s a fantastic seat to use with the Jenx Nursery Table, as it creates a great working space for lots of fun activities including working and playing with other children across the table. Everyone can find a use for Ziggy! 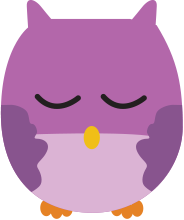 Ziggy is great for positioning, support, comfort and so much more! If you are away from home and need a corner seat to support a young child, simply bend Ziggy round into a ‘U’ shape and place on the floor – an instant corner seat. If you want to place your child prone with shoulders raised, but you don’t have a wedge, simply place him or her in position over Ziggy and bend the product around their hips to keep your child in mid-line. Try wrapping Ziggy around your waist as you sit – you’ll find it offers wonderful, soft support for your elbows. The question is: how many uses for Ziggy can you come up with? Click here to read some of our ideas.